The book offers a colourful palette of insights and inspiration, which go hand in hand with an account at the interface of education, theory and practice. Brick. 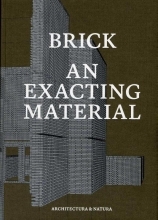 An exacting material, tectonics in contemporary Dutch brick architecture contains many drawings and photo`s.The texts are written by specialist, Aart Oxenaar (urban history), Louise Schouwenberg (design and material), Baukje Trenning (Amsterdam), Udo Garritzmann (tectonics), Machiel Spaan, Hans van der Heijden, Jeroen Geurst, Harrie Vekemans (legislation), Jaapjan Berg (interviews) . Graphic Design Joost Grootens. In cooperation with the Amsterdam Academy of Architecture.